As much as you want to, you want to live in a perfect society but you know that it is near to impossible. You know that there is no such thing as Utopia or perfect society. No matter how developed and progressive a society is, there are still flaws. Singapore is not an exemption. Though it offers a lot of chances and opportunities for citizens and migrants, Singapore is not perfect. Implementing rules is necessary to discipline the society but there are times that too much may cause restlessness. Citizens and tourists will feel afraid to go out for the fear of committing something or if they go out, they will constantly look at their backs. That is plain tiring. Singapore is dubbed as the “fine city” because there is a penalty for a single act that the government see harmful. For others, architectural uniformity is a good feature but to some, it is not appealing. Many Singaporeans combine English and Singapore languages (Chinese, Malays and Tami). They refer it as “Singlish”. If you get stuck in this conversation, you will find it hard to decipher the words. Misunderstanding will happen. 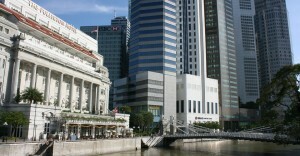 Singapore is famous for its standards or cost of living. In fact it is one of the expensive places to stay in Asia. The goods, services, transportation, food, fuel, houses are increasing every day. Despite the flaws, Singapore is a place that offers many opportunities. If you set your heart to love it, it will grow on you.